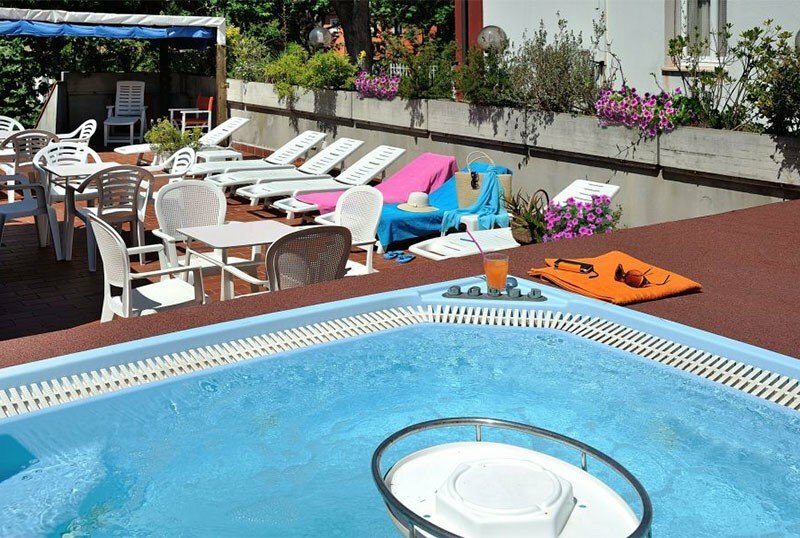 The 3-star Hotel Plaza in the center of Cesenatico is directly managed by the owners and offers a furnished garden, a sun terrace with hot tubs, a gym and facilities for children. Admits small pets. The property is located in Cesenatico in a central position: in a few minutes walk you can reach both the beach and the Leonardo canal port, the historic center of the city. STANDARD : equipped with all the services already listed. SUPERIOR : more spacious, recently renovated, renovated bathroom with shower, minibar included and balcony. FAMILY : 2 communicating solutions available. Garden furnished with tables and ping-pong, open-air porch, free use of bicycles, TV and reading room, professional billiard room, 24 hour bar, luggage room and lift. On the top floor there is a solarium area with a Jacuzzi, a small gym and a bar. PARKING : uncovered parking spaces available for all customers. AIR CONDITIONING : available in all environments at no additional cost. CONVENTIONS : beach, amusement parks, organized excursions. PETS : small pets allowed. BREAKFAST : sweet and savory buffet, with cakes, croissants, biscuits, cereals, juices, yoghurt, cold meats, cheeses and eggs. LUNCH AND DINNER : there are always three different menus with meat, fish and a buffet of vegetables and side dishes. VARIATIONS : vegan and celiac cuisine. OTHER : on a weekly basis a Romagna evening is organized with fresh homemade pasta, piadina and grilled meat or fish. In hotel : outdoor and indoor playground area, bicycles also with child seats, children's bikes, baby sitter (on request and for a fee). In the room : anti-fall rails (on request), cribs and tubs for the bathroom. At meals : baby menu, baby food, high chairs and booster seats. At the beach : live entertainment. The hotel has an agreement with Bagno Romeo, Adriatico and Renata. The first offers a playground, entertainment, playgrounds and mini clubs. The Bagno Adriatico has a playground area, mini club, disabled facilities, sports fields, lounge area. Finally, the Bagno Renata has basketball and beach volley courts, a playground, a ping-pong table and entertainment. The list prices are per day per person for a minimum stay of 3 days. - Upon confirmation, a deposit of Euro 200.00 is required per room.